I didn’t think I was the kind of person to camp in the snow, and thankfully I still haven’t earned this badge. We did get really close though. I just got back from a one night backpacking trip to Silver Lake, on the Mountain Loop Highway outside of Granite Falls, WA. We were the only campers there, and scored the one campsite that was neither snowy or soggy. We were rewarded for our climb with a stunning view of the partially frozen lake, waterfalls, towering mountains, and a rushing stream. Near the start of the hike- notice the snow far in the distance! 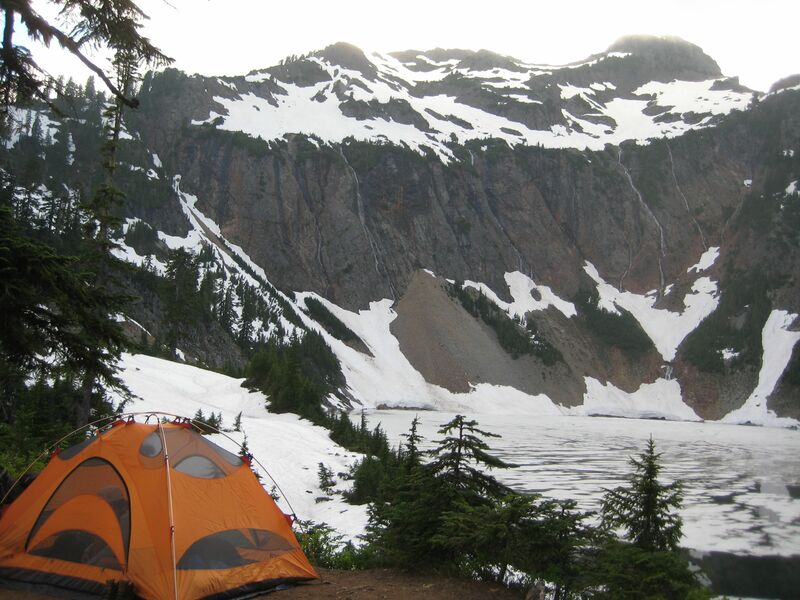 It was my first backpacking trip of the season, since I’m patiently waiting for the snow to melt in the Cascades. I picked a fairly low elevation destination and hoped for the best. Apparently mid-July is not quite patient enough! When we started our hike, it was sunny and 75 degrees at the car. The trail was snow-free the whole way up, until we reached our destination 6 miles later. So much for a refreshing swim in the lake! I felt sort of tough, camping near the snow. I was so happy our campsite was dry though! The lake sits in a valley that holds onto clouds and shields the sun. That must explain why there’s still snow. 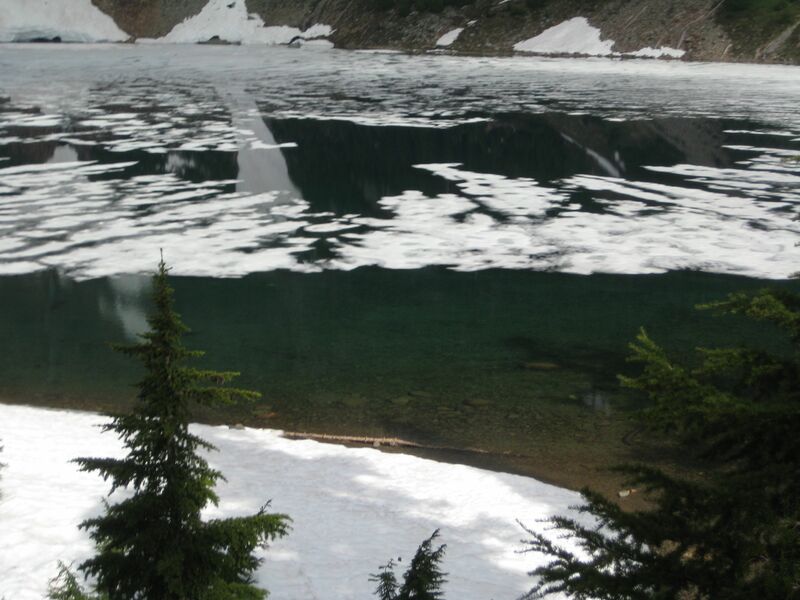 Silver Lake had actually melted a lot overnight! It should be swim ready (but cold) in no time! The Silver Lake hike is 12 miles round trip, but the first and last four miles are along a fairly flat closed road. So there’s really only four miles of up and down climb. 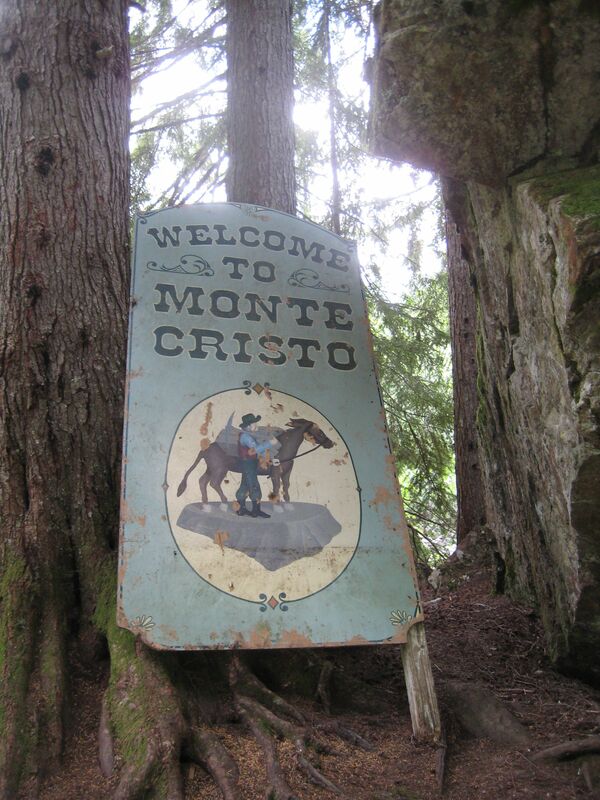 At the end of that four mile road is the old mining town of Monte Cristo. It’s not an operating town any more, but in its heyday (around 1900), it had four hotels, a school, a store, etc. Now it’s a tourist attraction and a nice place to have lunch. And if you’re more of a walker than a hiker, it’s a good place to turn around. 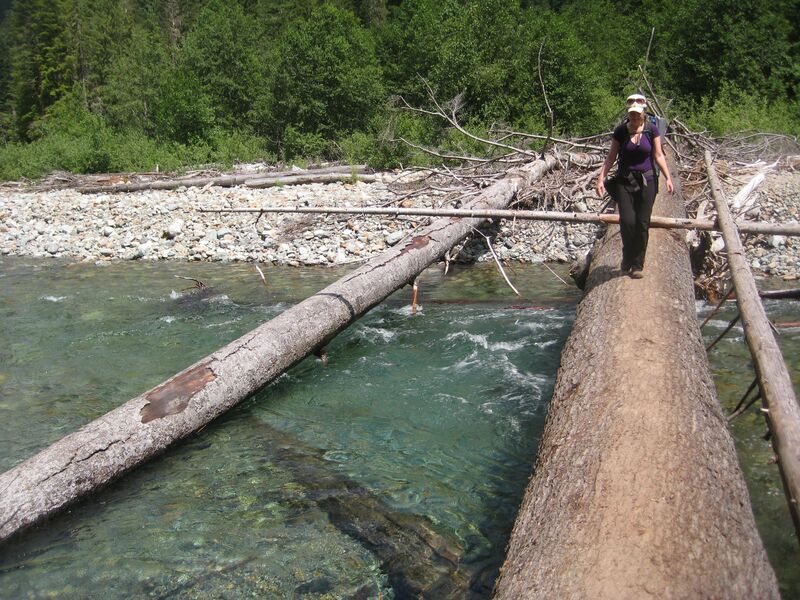 Walking back, there was a "dangerous" river crossing. The log was really big though. 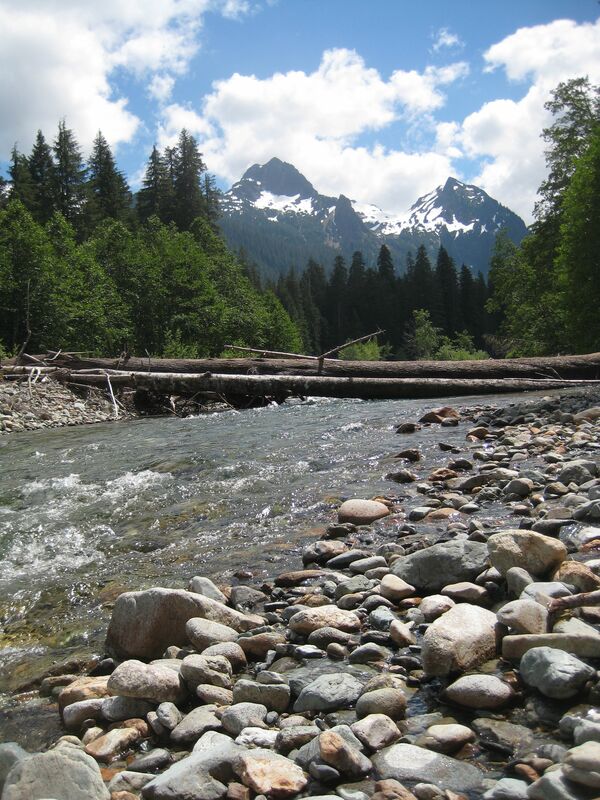 To get to the Silver Lake trail, drive east of Granite Falls on the Mountain Loop Highway for 31 miles. Then park at the Barlow Pass Trailhead. You walk through the ‘Road Closed’ gate, and from there it’s pretty self-explanatory. It’s about an hour and a half drive from Bellingham.